Several of Grace’s stories have focused on the fun she had with friends. If you read between the lines and pay attention to some of the short sentences you’ll notice that they didn’t have much on the farm in the thirties. The picture to the right is of Grace with her doll at the home place. There isn’t much (any?) paint on the wall. The concrete step looks a little rough around the edges. Look closely at the ground. Do you see any grass? How about Grace’s hand-made dress? This summer we took a road trip with the grand children. Their car had more toys and clothes than Grace had in the entire house. (That may be hyperbole, but not far from the truth.) In 2015 kids have electronic tablets, endless clothes, and multiple dolls with nicer clothes than Grace had on the farm. Grace ends this story with an anecdote that I could repeat almost word for word, just with a different childhood friend. Many times during my grade school years Cora White would come and stay overnight at our house or I would stay with her. 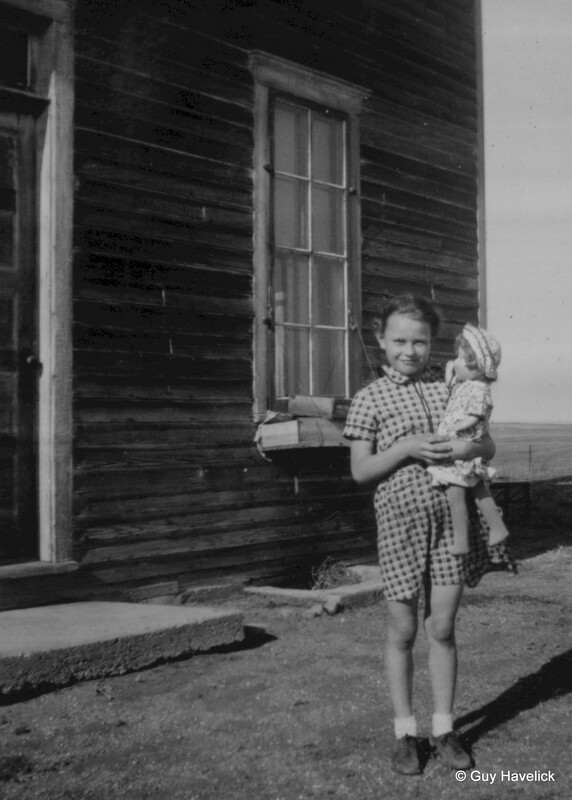 Their farm was less than a mile south from the schoolhouse so they always walked to school. Their house was one story and sprawling from being built on too. Cora had her own room as her older sister Florence was gone to high school and the boys shared a room. Neither of us had many toys. Dolls and doll dishes and a toy stove was about the extent of it. I remember they had a Chinese Checker game we played a lot. Mostly we would play house or school + do homework. Cora’s mother had taught school so books were real important at their house. I remember staying with Cora one winter when it was real cold. The bed was close to the wall and frost colleccted along the baseboard so the quilts got froze tight to the wall. They had a coal stove in the main room + that’s where would dress in the morning. Mrs White always made a good breakfast. Sometimes oatmeal and muffins but usually pancakes, big ones with lots of homemade syrup that she always served hot. After breakdast she would pack our lunch boxes + we woud walk to school. One time early in the spring I asked to stay with Cora + Mama said, “Sure some nice warm day I could when it was nice to play outside. So – the next warm day I walked home with Cora to stay overnight. Turned out that wasn’t exactly what Mama had meant and of course was pretty worried about me not coming home from school. Wasn’t long til Henry came to get me + quite thoroughly scolded me for taking off like that. After that I waited til Mama had made arrangements for me to go!! This entry was posted in Grace's Letters. Bookmark the permalink.